Two new iPhones have been unveiled by Apple, a flagship iPhone 5S and a lower cost iPhone 5C. 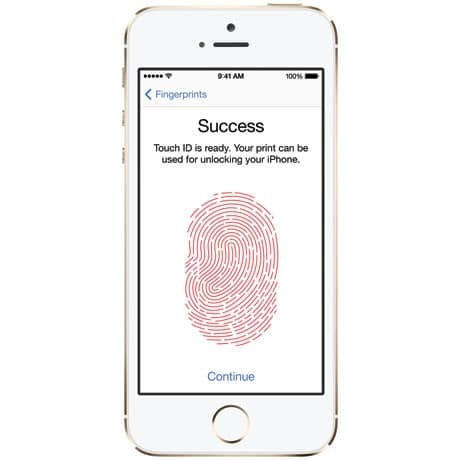 A Touch ID fingerprint sensor has been built into the home button on the iPhone 5S, as was widely anticipated, but NFC appears to have been omitted from the device yet again. The news follows the publication of a patent application that describes how NFC could be used in conjunction with the Touch ID sensor. The patent was filed earlier this year, indicating that there is still potential for the technology to be included in a future iPhone. Apple remains the only major manufacturer to not include NFC in its phones. It takes time, determination and negotiation to build bulletproof international standards and systems. This has been happening quietly in the background all along and, wherever we are headed, a large part of the journey is already behind us. NFC isn’t dead. It’s hardly got started. I’ve got a 4S and didn’t buy the iPhone 5 because it has no NFC, i was waiting for the 5S for this reason… So, now I think I will buy another brand. Shame on you Apple !! All readers… Go to nfcworld.com . They are the dominant watch dog for the NFC technology. They do a weekly update and have a news archives file back to Oct 2008. If you think NFC is dying…guess. Its growing by leaps and bounds, and America is way behind. BIG…BIG..Mistake by Apple. Here we are 2 years in the future and of course Apple has once again adopted another technology long after everyone else, this time NFC. Of course the timing was perfect to spur a complete upgrade cycle for everyone to fill those coffers with cash! Sorry, even us Apple fans can be cynical. NFC is not in Apple’s plans at the moment. They are working on a different competitive technology for that, called iBeacons. iBeacons is part of iOS 7. The beauty of it is that it will work on any iOS device using Bluetooth 4.0 and iOS 7. So, not only on the latest iPhone. That’s like saying “No NFC, but camera”. They’re different things with different use cases. It’s sad that people are so quick to characterise situations like this as battles with only one possible winner. It’s superficial and lazy analysis. Yes, NFC and iBeacon are different things, but they both can be used for the same purpose, at least from the user’s point of view. The main advantage of iBeacon over NFC is distance. For communication between two NFC devices you need to be, what – less than 10cm apart? While the iBeacons (Bluetooth Low Energy, or BLE) range is, they say, 50 m, but lets say in reality it is 15 m. That is still a huge difference. That’s why during Apple’s WWDC keynote back in June, when Apple presented AirDrop in iOS 7, they made fun of NFC when they said: “There’s no need to wander around the room, bumping your phone”, which also tells me NFC is not in their plans. There are already some products on the market, ready to take advantage of iBeacons. Two examples, search for “theapptile”, or “Estimote Beacons”. Or a third example, even more interesting than the two before, search for “Paypal Beacon”. So I’d say that “No NFC, But iBeacon” is a valid statement. The limited range of NFC is a feature, not a drawback. There are situations where it may be desirable “to wander around the room, bumping your phone” whatever Apple may say. And there is rather more to NFC than just the radio side. As I said, different things with different use cases. iBeacons it’s an alternative to NFC but with more possibilities. Check in the internet before think be the best. Are you American from Texas? Oh? Has somebody on the internet mentioned iBeacons and predicted the death of NFC? I must have missed that bit of doubtlessly rigorous analysis. My understanding is the aluminum case of the S blocks transmission of the NFC signal, but I thought they would have solved that. It wouldn’t make sense that they would put it in the C, but not the S, even though the C has a plastic case. If the 6 doesn’t have it then I’m going to defect to Samsung. I love Apple but their getting lazy and arrogant. At least the S has 5GHz finally when the HTC one and S4 have had it for a while now. Apple has planned to adopt NFC with Liquidmetal housing which does not block NFC signal. As you may know, Apple invested $11million and another $20 million to Liquidmetal Technologies to acquire exclusive use of liquidmetal in consumer electronics. However, due to manufacturing issue of liquidmetal housing, Apple cound not but use aluminum housing instead. That’s the reason why Apple did not adopt NFC for iPhone 5S, I believe. For iPhone 5C, NFC can be adopted since it has plastic housing. But iPhone 5C is the one with lower cost without NFC. This is a strategic decision from Apple. They hold quite a large patent portfolio in NFC tech, but made the decision to stop any further US momentum/adoption. Apple would be playing the follower role in this space and with the cries of “lack of innovation” being yelled from rooftops, I believe Apple decided implementing an existing technology would add flames to this fire (even if augmented by fingerprint authentication). Perhaps the ball has moved far enough with NFC mobile payment roll outs expected in 2013/2014, but sadly, I am not holding my breath. The world is adopting, however US retailers won’t invest if Apple is not on board…and Apple knows it. They would rather repackage Bluetooth technology based on a new spec, as their own, then enter a market in which they obviously missed first mover opportunities. Analogous to child whom is afraid to compete/lose saying “Fine, I’ll take my ball and go home” if they are not in control of the game. The irony is that one of the main hurdles of NFC payment adoption are the security questions. WTF? Bluetooth (Smart, LE, 4.0 ) are highly insecure. If interested and want to geek out, go check out YouTube and search “Hacking Bluetooth Low Energy: I Am Jack’s Heart Monitor”. In the end consumers always figure it out. My memory is long and I have been there, first hand to the previous rise and fall of Apple. Anyone else remember the 80’s? Apple had a strangle hold on computing everywhere? What happened? They lost the people, the “cool” went away and they were no longer the best technology. Rather than being disappointed with Apple I am expecting that history will repeat itself. All signals are pointing to that the pendulum has already started to swing. Apple is having a much harder case to make to choose their products against alternatives. Time will tell, but obstacle and limitation based competition strategy is pathetic (not to mention ineffective..MS tried this for years) and only consumers lose. What about this mobile payment app called Isis. I see most of the major phones have this pre-installed. How is this different from NFC? It appears to be something that apparently works. Could someone comment on this ? Isis is based on NFC. As a technology it certainly works, and it is set to roll out across the US at the end of the year. The launch of Isis could be the moment that iPhone owners start to realise that they’re missing out on something.